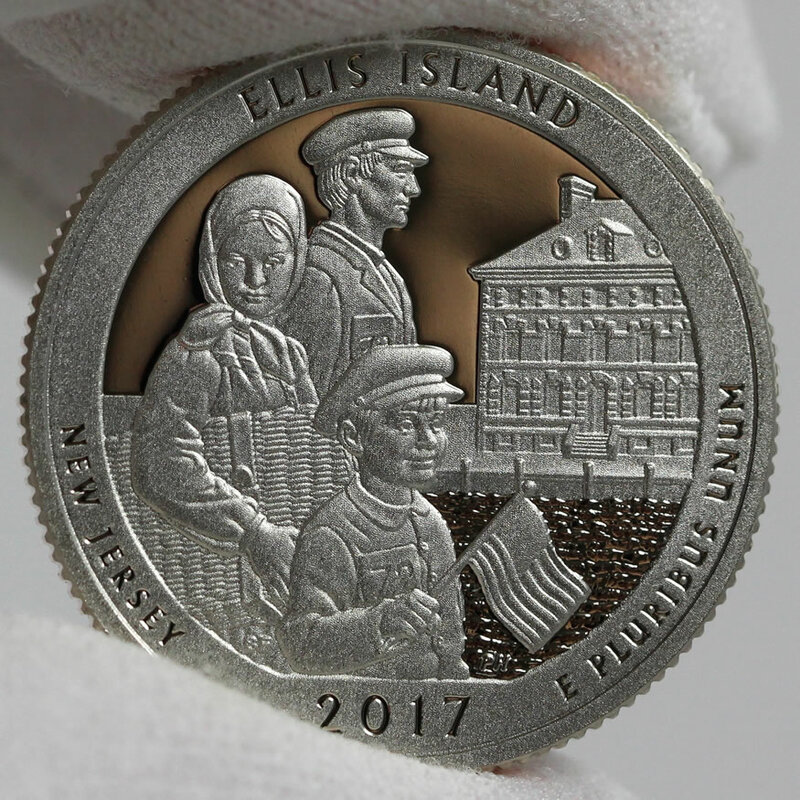 This article presents photos of New Jersey’s Ellis Island quarter, the fourth of this year’s five coins from the United States Mint’s series of America the Beautiful Quarters®. Events in the last week of August will introduce a quarter depicting Ellis Island, the gateway from 1892 to 1954 for over 12 million immigrants to the United States. 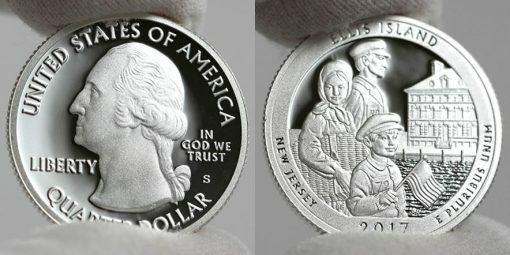 On Monday, Aug. 28, the quarter commemorating the site launches into circulation and the U.S. Mint begins selling them in roll and bag products. 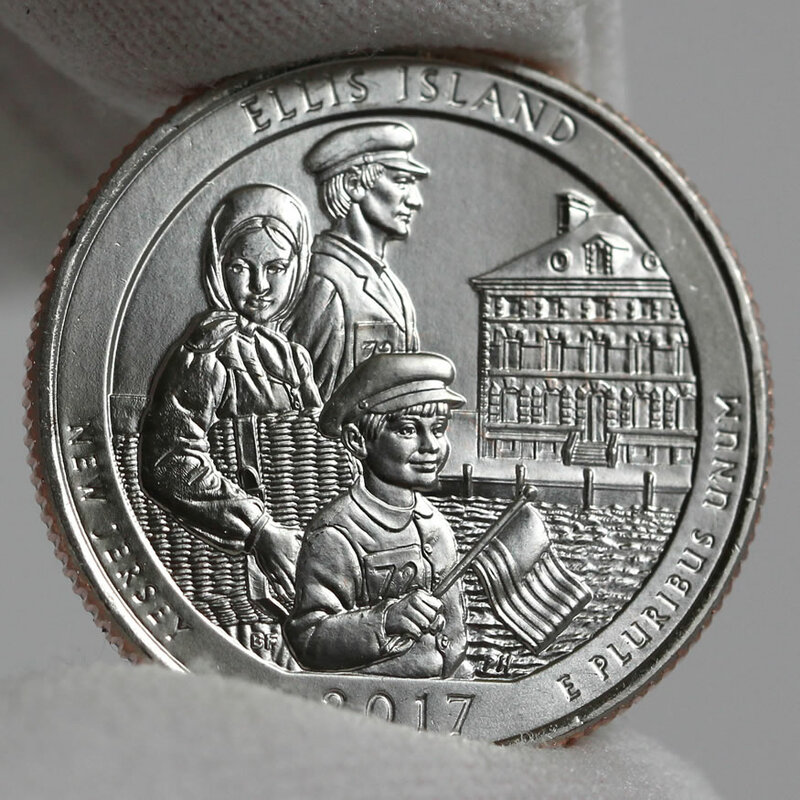 Two days later, on Aug. 30, the U.S. Mint and National Park Service will officially introduce the quarter in a ceremony on the island itself. 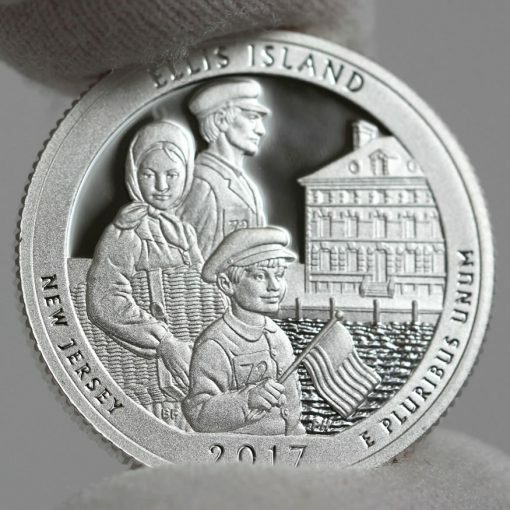 Five 2017 proof quarters for $14.95. Five 2017 proof silver quarters for $31.95. Ten 2017 uncirculated quarters for $12.95. 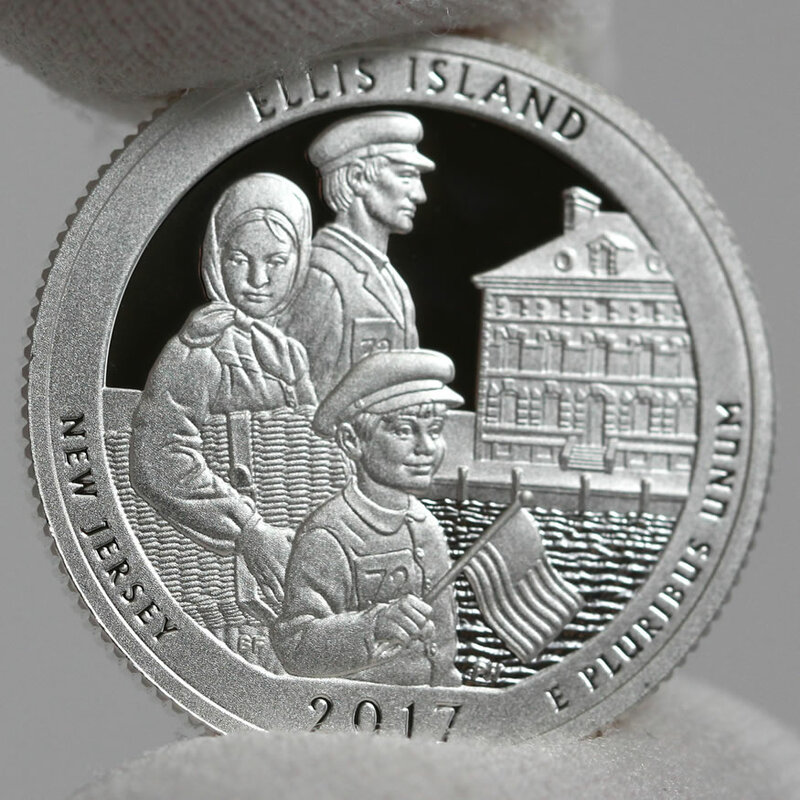 Proof coins feature sharp design details, frosted foregrounds and mirror-like backgrounds. 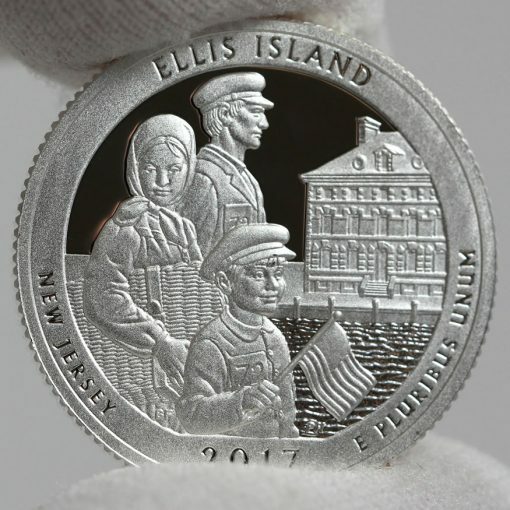 Uncirculated coins, which look most like those in circulation, are produced from burnished blanks and usually pressed at least twice, resulting in sharper details and more brilliance. To offer a better look at the Ellis Island quarter, we photographed several proof and uncirculated versions and share them now. All quarter obverses (heads) share the same design, the 1932 portrait of George Washington by John Flanagan. 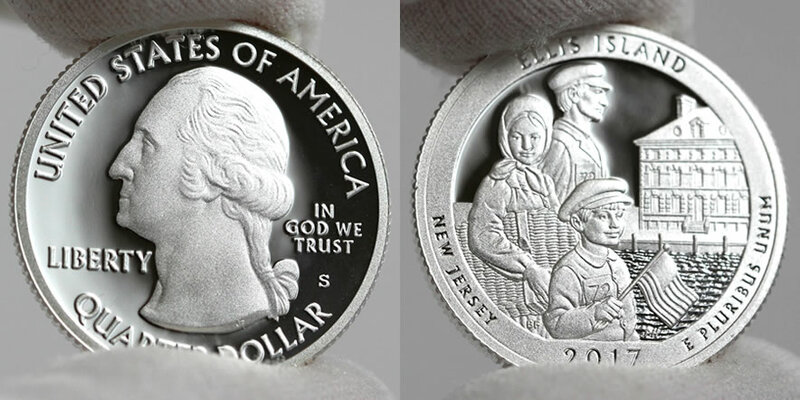 America the Beautiful Quarter reverses are emblematic of the site they honor. The quarter for New Jersey is the 39th issue in the ATB series and the fourth of five for 2017. Designed by Barbara Fox and sculpted by Phebe Hemphill, the Ellis Island quarter depicts an immigrant family approaching the island with a mixture of hope and uncertainty. 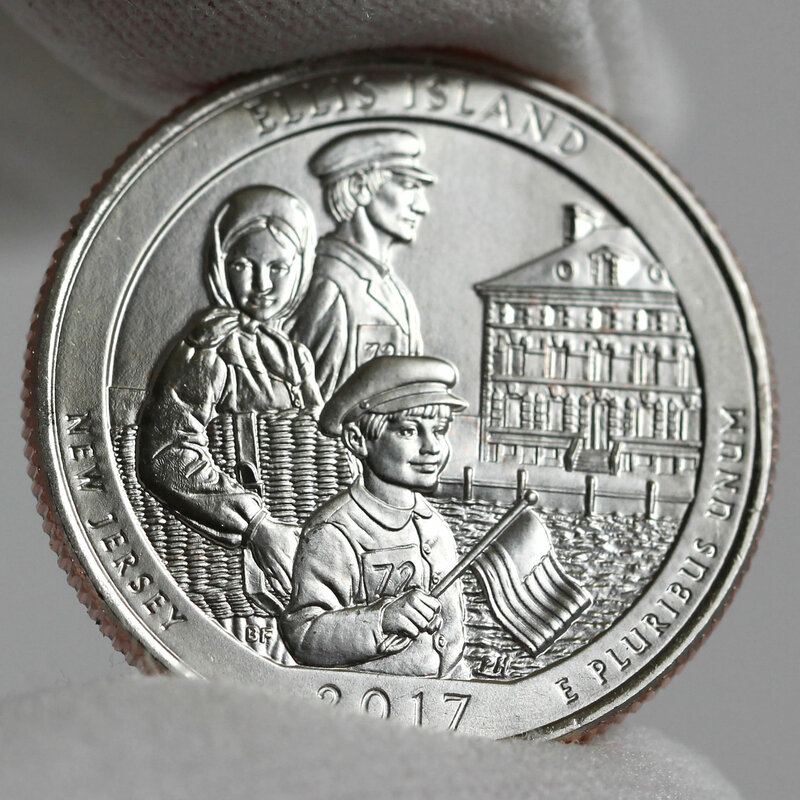 It was selected after refinements following a review of candidate designs in late 2015. Inscribed around the design are ELLIS ISLAND, NEW JERSEY, 2017 and E PLURIBUS UNUM. 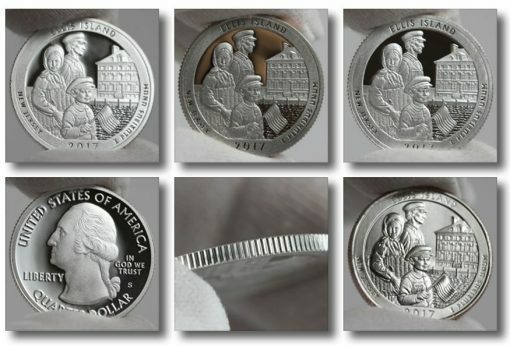 The San Francisco Mint produces proof quarters, with photos of a clad edition shown here and a silver version in the next group. 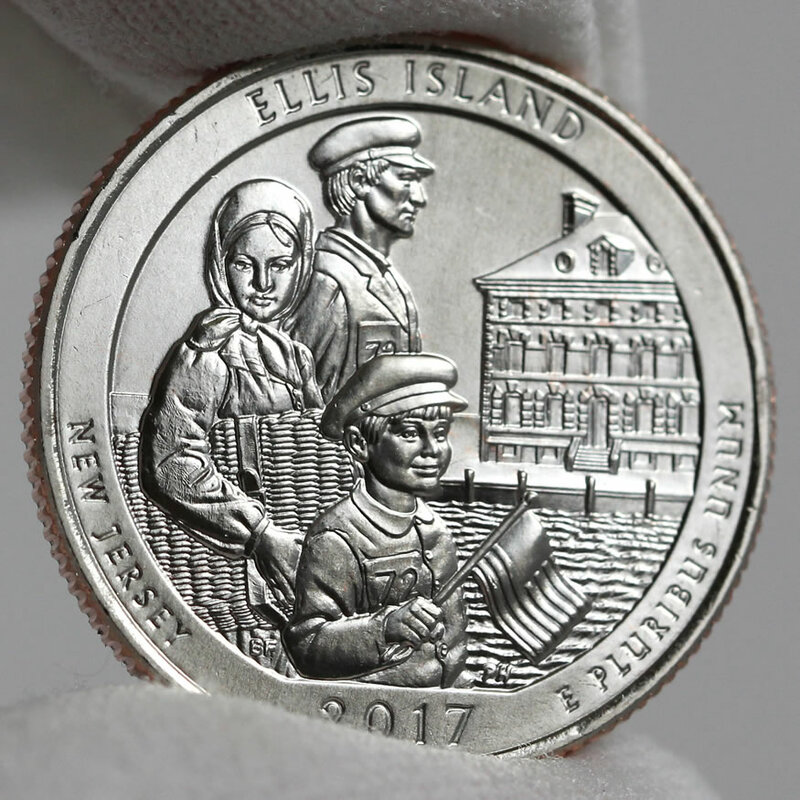 The clad proofs are made from the same composition as regular circulating quarters — 8.33% with the balance copper. Their sharp reliefs and mirror-like backgrounds set them apart. 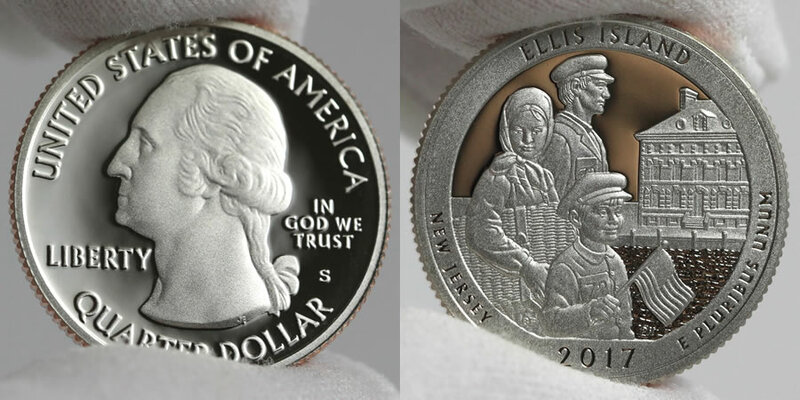 The U.S. Mint’s silver coins in collector proof sets are composed of 90% silver and 10% copper. These next photos show a silver proof quarter. It is often difficult to quickly notice the difference between clad and silver proof quarters because they have the same finish and diameter of 24.26 mm. Quarters in silver do weigh more at 6.250 grams compared to clad quarters at 5.670 grams. Instead of pulling out a scale to tell them apart, look at the coin’s edge. The clad quarter will have a visible copper layer. 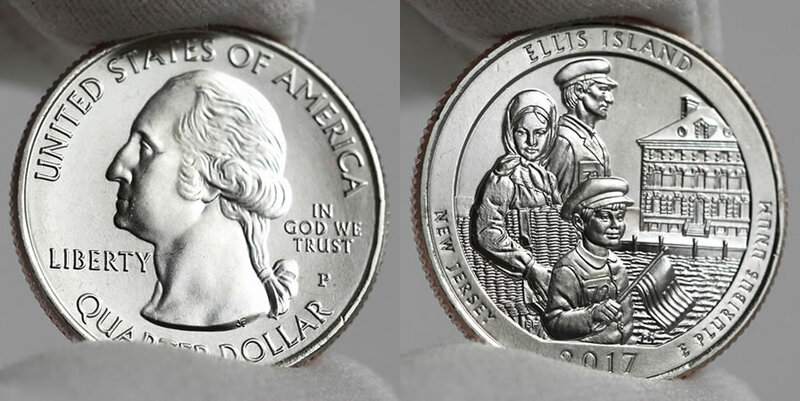 Uncirculated quarters are produced at the Denver and Philadelphia Mints. Below are a few photos showing their appearance. The other four 2017 quarters depict Effigy Mounds National Monument in Iowa, Frederick Douglass National Historic Site in Washington, D.C., Ozark National Scenic Riverways in Missouri, and George Rogers Clark National Historical Park in Indiana. the boy carry which country of the flag ? No stars ,what kind of joke from the designer. The flag look like The British East India company. ,and Liberia. 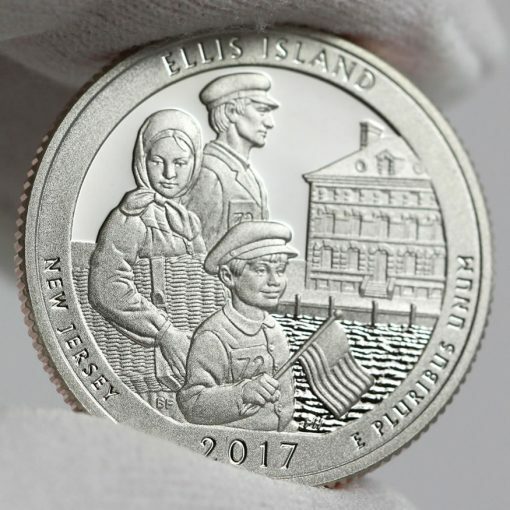 The coin is nice overall. 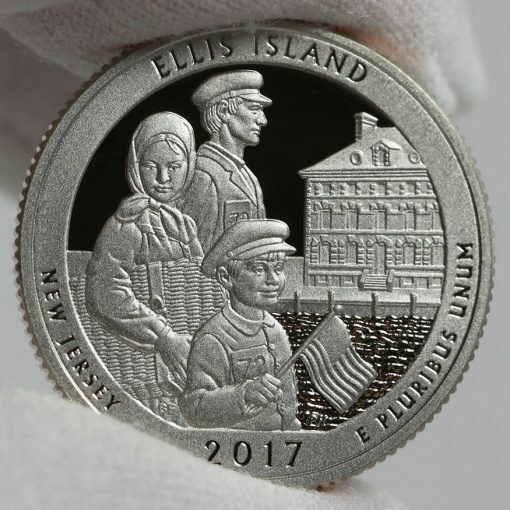 I found an error on this coin. It looks like it could be a partial collar error.